We are sad to report the loss of another greyhound. 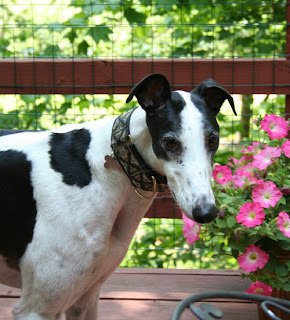 We received notice from Rhonda Feihler that she lost her greyhound Grady last month. Rhonda (and her previous partner Robin) adopted Grady in 2007. Grady was a return to our group because the people who adopted him did not want to keep him when he started having seizures. Shortly after he came back, Rhonda and Robin contacted us when they saw him on our web site. These were the days before Craiger’s List. At the time they lived in Ohio. But because they were seasoned and experienced greyhound adopters who adopted special needs greyhounds, we made arrangements for them to adopt Grady. Grady was greatly loved by Rhonda and Robin and they were able to manage his seizures well. Rhonda took Grady with her when she moved from Ohio to New Jersey but she kept in contact with us throughout the years. Grady did so well and had very few seizures. However, he had one last seizure last month and the vet reported that he most likely suffered brain damage from it because Grady was non-responsive. Rhonda sadly let Grady go. Grady would have been nine years old in July. We are sad to hear of the loss of a beloved hound. However, we know that Grady had a wonderful home where he was greatly loved and cared for so well. Many greyhounds, especially those with special needs like Grady, never get that chance. Run with the wind Grady until we all meet one day at the bridge.